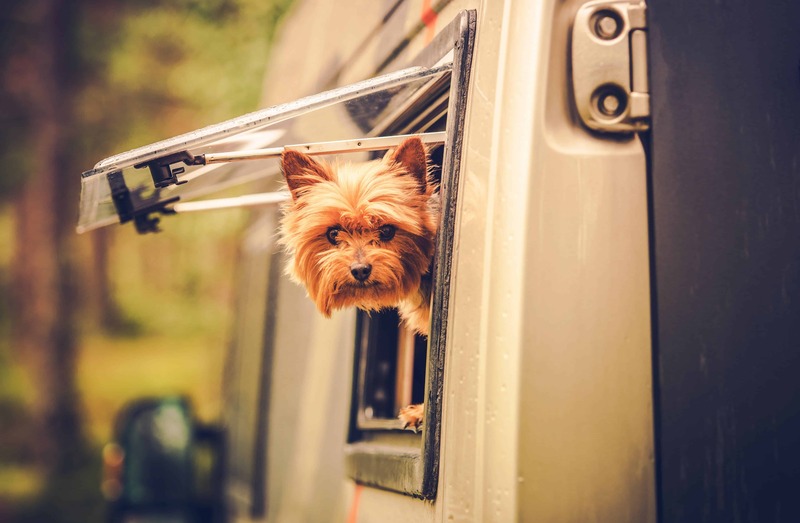 Loading up your RV to begin a new adventure on the open road can become even more memorable if you are able to bring your doggie companion(s) along for the trip. 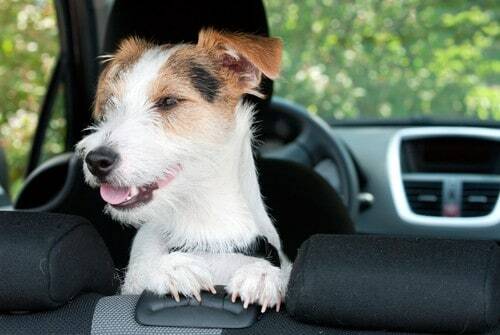 But before you hit the road, make sure you’re prepared for any and all doggie road trip disasters. Jamming to throwback songs like “Party in The U.S.A.” (no judgement) while driving your RV to a lush forest, sagebrush-filled desert, or sandy beach is enriched so much more by dog hair, slobber, and wet nose kisses. However, it’s crucial to consider two things before taking this kind of journey: 1) Dogs successfully joining you on your next RV road trip is possible, and 2) there is, unfortunately, an endless list of possible things that could wrong. In order to achieve point number one, it’s best to be prepared for anything that could happen in point number two. 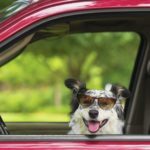 I may not be able to predict the future or transform into critically acclaimed dog whisperer Cesar Millan, but I can try to prepare you for at least four possible doggie road trip disasters and how to avoid them. If your doggie hasn’t learned by now that bees are not the best snack to tide them over until supper, there is the chance that they might learn this lesson during your road trip together. While eating a single bee is not a disaster (slightly uncomfortable for them, picture worthy for you) if your dog decides to take on an entire beehive, you’ll be cutting your trip short. To avoid this, be sure to thoroughly inspect the surrounding area of your decided camping spot for hives of tasty looking bees. If you do find a beehive nearby, not all is lost. A dog tracker is one of the best pieces of dog gear to bring along for camping and road trips. You can attach the tracker to your furry friend and set up a safety perimeter and it will alert you when your dog tries to head into a mouthful of stings. Your dog’s face will thank you. Your dog doesn’t like the way your RV has been looking at him. It’s fair to say that dogs have a tendency to chew on the most inappropriate things. A great part about camping with your dog is getting those chewing teeth on something other than your award-winning macaroni art. Beach or desert, there are usually plenty of sticks, twigs, driftwood, and of course, you packed plenty of chew toys — what more could your dog’s gnawing teeth want? Apparently, the bumper or tires of your RV. You only looked away for 5 minutes, but clearly you’ve underestimated your dog’s need to chew. Back home, you’ve probably already taught your dog how to stop inappropriate chewing, but this is a whole different kind of disaster (although, honestly, you’re still not over your macaroni art piece). Evidently, your dog really doesn’t like your RV, and you didn’t bring enough hot sauce or bitter apple cream to cover an entire bumper or set of tires. To avoid such a costly disaster, it’s important to always familiarize your dog with its temporary mobile home. Show your dog that the RV is there to keep you warm at night, protect you from any bothersome campsite neighbors, and keep you from smelling like a pair of feral mountain men. Overall, just let your dog know that the RV is a safe and harmless thing. 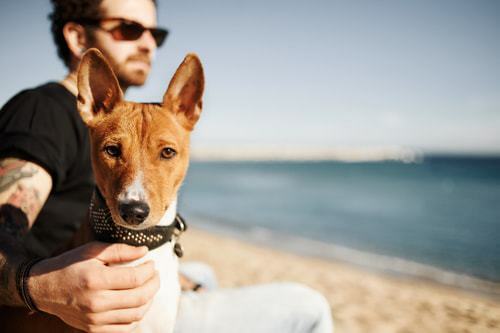 If you think your dog might still take a bite into it, consider keeping your furry friend on a leash, away from the tempting metal or rubber. A bear falls in love with your dog and returns to your campsite to ask for its hand in marriage. Your dog doesn’t seem to really notice, but the bear has clearly fallen head over paws for your dog. Sure, a bear and a dog could probably live together in perfect harmony, but do you think your dog is really ready for this kind of commitment? What about a place to live? Would they want to stay with you until they found a place of their own? Do you even have enough food for all three of you? Probably not. It’s best to let the bear down easy, explain that marriage is a huge commitment, it’s only just met your dog, and divorce lawyers can be really expensive these days. If, after you’ve told the bear it’s best to let your dog go, it still persists, becoming aggressive or violent with heartbreak, bear mace is an essential tool to bring along with you during your road trip. Being prepared for any kind of uninvited guests (or unexpected proposal) is vital for you and your dog’s safety. Don’t worry though, the bear will find someone else. You surprisingly acquire a second (or third) dog while on your road trip with your current companion. However, you soon realize your new dog is actually a raccoon. Look, it’s an easy mistake. If this happens, you should first consider getting your eyesight checked as soon as you get back to civilization. Secondly, be sure to immediately return to the place you picked up the second dog/raccoon and release it back into the wild where it belongs. Certain wild animals can seem really friendly and cute, but it’s better for them to not join you and your dog on this adventure. The raccoon, however, will surely always remember your kindness, and when he looks up at the moon he will think that maybe, just maybe, you’re looking up at it too and it’ll warm his little raccoon heart. 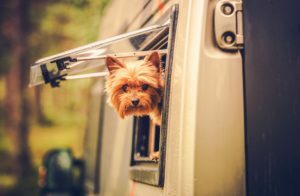 Taking a road trip with your dog in your RV doesn’t have to be a recipe for disaster. While it’s not easy to predict every situation that might come up along the way, being well prepared can ease your mind, letting both you and your dog make exciting, lasting memories on this adventure together. This was such a cute and fun article. I always have this fabulous fantasy in my mind of what road tripping with my dogs will be like, but it’s usually a nightmare. We still laugh about it though, later. Much, much later. Once the car stops smelling like dog poop.